Text analytics is a process that helps to better exploit unstructured information by adding structure to the content in the form of new metadata values. The optional Coveo Text Analytics module allows you to analyze and tag indexed documents containing specific information. Once this information is in the index, you can use it to create facets, provide relevant query suggestions, analyze, consolidate and correlate documents and trends to offer a better insight to the end-user. The following are examples where text analytics can be applied and provide great benefits. End-users can efficiently drill down to documents they are looking for using facets. You can use text analytics to extract themes and named entities and create facets based on this information to improve search results navigation. Finding experts on a subject or domain is a need found in many organizations. Text analytics can help identify experts based on dynamic analysis of how people in an organization are linked to content (authors, owners, mentioned in, linked to). Customer service agents generally need to find answers and solutions to client's issues from a large number of structured and unstructured content sources. You can use text analytics to extract many relevant information types from case descriptions, knowledge base articles, wikis, issue tracking systems, emails, etc. When an agent opens a case, Smart Relations lists automatically present related content from various sources. Knowing what clients think of products is key information to all successful businesses. You can use text analytics to extract company names, product names, themes and perform sentiment analysis on customer review sites or forums, and then create facets based on this metadata. Product management people can then easily analyze what customers like and dislike about their company's products and those of their competitors. 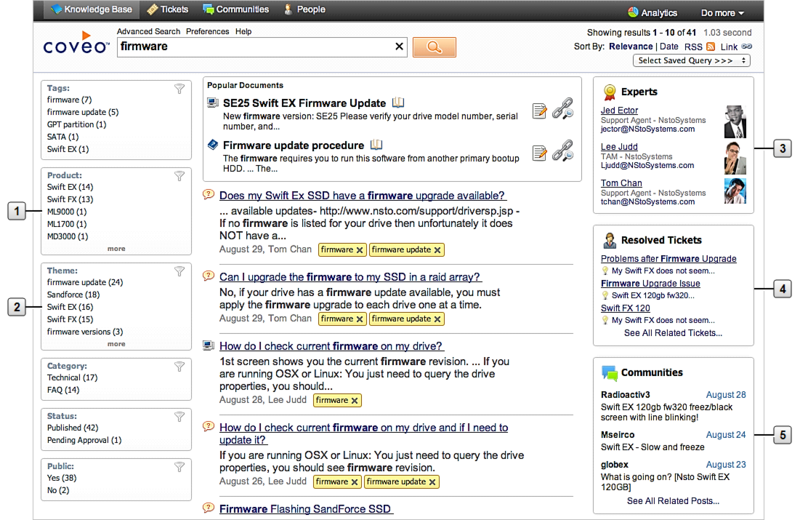 Example: In the following Knowledge Base console, the user searched for firmware and gets matching knowledge base articles in the middle of the screen. The user can then use the facets on the left to refine search results and review related information from other sources on the right. Text analytics is behind several insightful user interface elements of this console. Product facet based on the extracted Product named entity. Theme facet based on the extracted Themes. List of Experts built by linking extracted People named entity with keywords and Themes. List of Resolved Tickets from issue tracking system sharing similar extracted Themes as the current search results. List of posts from Communities sharing similar extracted Themes as the current search results. A tool used to register, setup, and manage text analytics configurations (see TAnGO Administration Tool). The service responsible for launching and monitoring runs and jobs (see Coveo Job Scheduling Service). A set of useful plugins that you can assemble as building blocks to easily create a complete text analytics pipeline (see Text Analytics Run Plugins and Predefined Text Analytics Job Plugins). A text analytics pipeline can use an entity discovery plugin (Salience) to extract themes and named entities as well as perform sentiment analysis from documents (see Entity Discovery Plugin). The CustomImplementations C# framework includes the code of all predefined plugins (see Text Analytics C# Developer Framework). 2.0.13+ November 2012 Addition of the LoggingVerbosity pipeline global configuration parameter (see Text Analytics 2.0.13+ (November 2012)). Addition of the FetchBatchSize pipeline global configuration parameter (see <FetchBatchSize>). Addition of new predefined job plugins (see MasterFieldMoverJob, ClearFieldJob).